My Mom and Grandmother loved any kind of cobbler. And when the peaches came in, there was sure to be a peach cobbler for dessert. But my mother and grandmother did not always cook with a recipe, they just knew. When Grandmother talked about preparing food, it was a handful of this, a spoon of that, and after decades of cooking, she just knew. Sometimes in recreating their recipes, their is a lot of trial and error. When Chuck and I married, his mother sent me a copy of the Vincent family cookbook, a list of recipes she compiled over the years of all the family favorites. I didn’t realize how different Southern cooking can be until looking at those recipes. Artichoke hearts is a favorite ingredient with their family. To me, it was just one of those things I saw on the shelves of the grocery store. 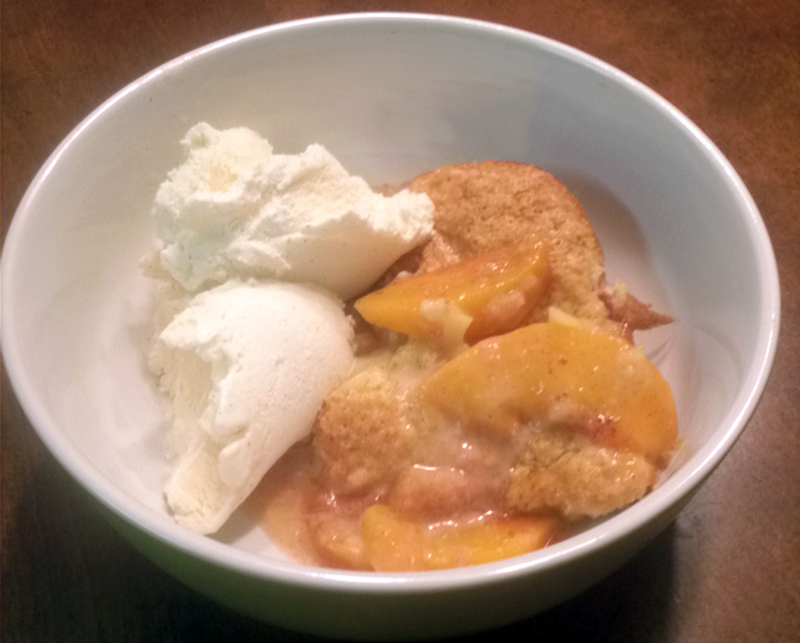 Amid the recipes I’m not familiar with, there were many that I was including peach cobbler. Chuck is such a sweetheart. He loves to cook. He offered to make the peach cobbler. We had to go to two fruit stands before he found the peaches he was looking for, the really ripe ones that demand your immediate attention.